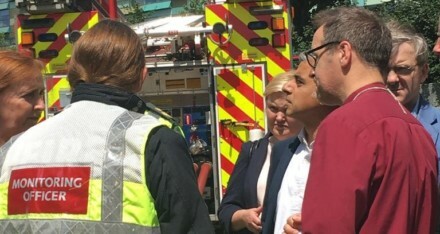 Following the tragic fire in West London, a community response and evacuation centre has been set up in nearby St Clement’s Church in Treadgold Street. The church opened its doors at 3am on Wednesday morning to take in those who were evacuated from Grenfell Tower when the fire started, it will stay open all day for those affected by the fire. A social media campaign was initiated early in the morning to urge Londoners with spare clothes, toiletries, toys, nappies and food to donate them to St Clement’s Church for those who have lost their homes in the fire. Due to the volume of donations received St Clement’s are now at capacity and are not able to accept anything further. Other local churches such as St Peter’s, Notting Hill, are still accepting donations and a number of online appeals have also been set up. Other churches in the wider deanery are drawing together volunteer teams who are able to serve tea, coffee and food, listen to people, pray with people and in general to show compassion to those impacted by the fire.